The typical American child eats about triple the recommended amount of added sugars, half from food and half from drinks. There are new recommendations out from the American Heart Association. 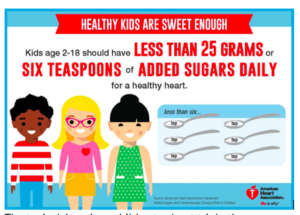 Children and teens should consume less than 6 teaspoons of “added sugars” a day and drink no more than 8 ounces of sugary beverages a week, according to the American Heart Association. A panel of researchers took a hard look at how sugar impacts cardiovascular health between the ages of 2 and 18. The recommendations for children younger than 2 is to avoids any added sugars, providing instead nutrition-packed food for growing healthy brains and bodies. Food and drink that contain sugar naturally are great, but added sugars – which go by many names and find their way into many products – may not be. Studies linking added sugars and conditions that lead to cardiovascular disease – the No. 1 cause of death in the world – have been around for years. Diets high in added sugars have been connected to heart risk factors such as obesity, diabetes, high blood pressure and unhealthy cholesterol levels. Children are developing eating habits and taste preferences that will last a lifetime. The sooner families begin to limit the amount of added sugars in the food they eat, the better. How often should a kid poop? The answer to this question is “that depends”. As long as the child is comfortable and the poop is soft and easy to pass, the frequency is not an issue. A diet that includes whole grains breads and cereals, 5 or more servings of fruits and vegetables, dairy foods that provide good sources of calcium and other minerals such as milk and other low sugar or sugar free drinks helps keep kid’s guts functioning well and regularly. Sometimes things do not go as smoothly as we like, so occasional constipation can occur and is normal. Use of an over the counter stool softener or bulking agents such as miralax or Colace can correct occasional constipation. For some children, constipation can be more frequent and cause problems. Working with your child’s doctor or pediatric dietitian can help establish a plan that will help straighten out this problem.